Sweetwater Creek. Photo courtesy of Georgia State Parks & Historic Sites. Nothing can top a breathtaking view of Georgia's forests painted with a myriad of oranges, reds and golds in the crisp autumn air. Georgia’s leaves change colors in October, and Georgia State Parks & Historic Sites are the perfect place to enjoy leaf-peeping during the peak of fall color. Autumn weather beckons trail-goers to enjoy the cooler climate via water, wheels or trusty hiking boots: feel the leaves crunch underfoot while hiking, breeze past a blur of fall foliage on a mountain bike, and paddle the waters and gaze at the leaves both above in the trees and below in the water’s reflection in Georgia State Parks and Historic Sites. Georgia State Parks feature stunning views of the changing leaves for experienced and novice hikers alike. Take a breath of fresh fall air and admire the colorful views of Georgia, North Carolina and Tennessee at Black Rock Mountain State Park’s scenic overlook. Those looking to take a walk on the wilder side can scale beautiful summits on the 7.2 mile Edmund C. Backcountry Trail, where the crest of Lookoff Mountain offers a stunning vista of Wolffork Valley and surrounding mountain ranges. Vogel State Park’s four mile Bear Hair Gap Trail is family-friendly, and offers a birds-eye view of Lake Trahlyta. For beginners circle the one mile Lake Loop to a miniature waterfall that is framed by the surrounding golden foliage. 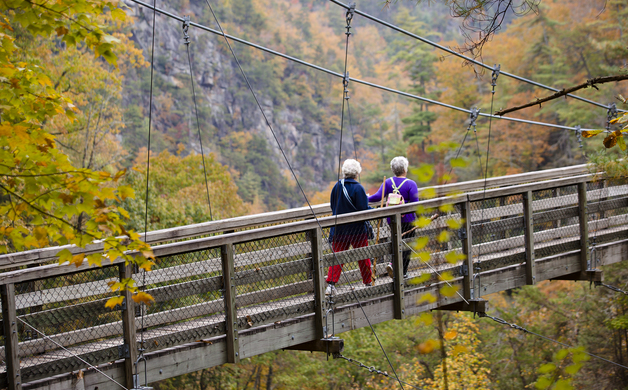 Tallulah Gorge State Park is one of the most spectacular canyons in the Southeast, and you can choose from easy or difficult trails. Hike along the rim to several overlooks with waterfall views, or get a permit from the park office to trek all the way to the bottom. During three weekends November, you can watch expert kayakers plunge down the river during the bi-annual “whitewater release.” Watch from the gorge’s east and west rim trails. Moccasin Creek State Park, Georgia’s smallest state park, sits on the shore of a gorgeous deep-green lake. Despite its mountain location, the park is relatively flat, so the hiking trails are great for families of all ages. Choose to hike the 2-mile Hemlock Falls Trail or 1-mile Non-Game Trail that leads to a wildlife observation tower. Mountain bikers will get their fill of fall thrills on Georgia’s mountain biking trails as they speed down invigorating hills and breeze past colorful overlooks of the Chattahoochee National Forest at Fort Mountain State Park. Put your endurance to the test on 14.6 miles of trails on the East/West Loop that includes a technical downhill section through a powerline alley. 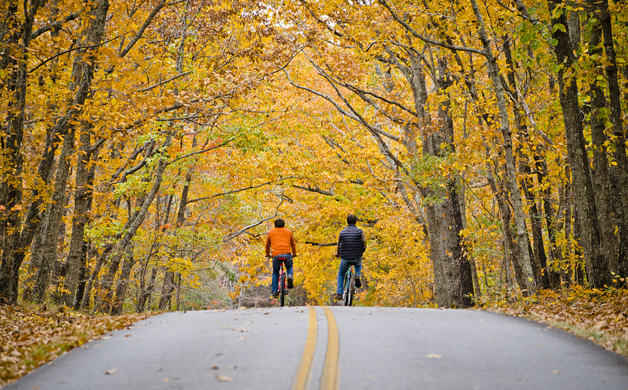 Race past bright fall colors and scenic views in the open forests of Unicoi and Red Top Mountain state parks. Even seasoned cyclists are tested on Unicoi’s seven-mile bike trail, that parallels Smith Creek. See rich autumn views at the higher elevation portions of the trail. Circle Red Top Mountain’s meandering four-mile Iron Hill Trail loop while admiring the spectacular sights of Lake Allatoona’s autumn foliage. All three parks belong to Georgia’s Muddy Spokes Club, a series of mountain biking trails created to challenge experienced and casual cyclists alike to tackle 68 miles of trails in 11 state parks. 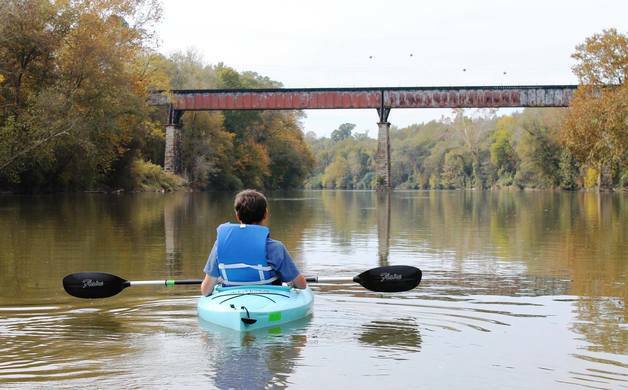 Chattahoochee Bend Fall - credit Desi Fowler. At Moccasin Creek State Park, the 2,800-acre Lake Burton is a prime spot for fishing and paddling, and in fall bass, crappie and bream are easy to catch. The park is only open until November 30, so take advantage of this gem—RV camping is popular at the park’s 54 campsites. Those looking for an outdoor getaway can find a variety of accommodations that allow visitors modern luxuries while nestled for a night in the wilderness, including yurts, cabins and campgrounds. One of the most scenic locations is at Cloudland Canyon State Park, where the 10-yurt village sits on the edge of the canyon, and at Tugaloo State Park, where six yurts are positioned on the banks of Hartwell Reservoir. If nature-goers are looking for an elegant mountain retreat, Smithgall Woods State Park offers six beautifully decorated cabins. Some cottages provide a charming porch along the stream, while others have private hot tubs. Traverse the one-mile trail from any of the six cottages to reach a stunning view of Dukes Creek Falls. Wondering when is the best time to visit? Only Mother Nature knows for sure, but peak color in Georgia is usually toward the end of October or early November. To help leaf peepers find the best scenery, Georgia’s State Parks offer an online “Leaf Watch” travel planner, found at GaStateParks.org/leafwatch. Georgia’s State Parks are affordable destinations for vacations and quick getaways. Waterfalls and lakes, salt marsh and mountains are just some of the beautiful environments of the state parks. Georgia State Park Golf Courses offer the best variety and value around. With eight golf courses to choose from, each features natural settings and picturesque surroundings, as well as fun and challenging play. Most state parks offer fishing, boating, hiking, camping, geocaching, birding and more. 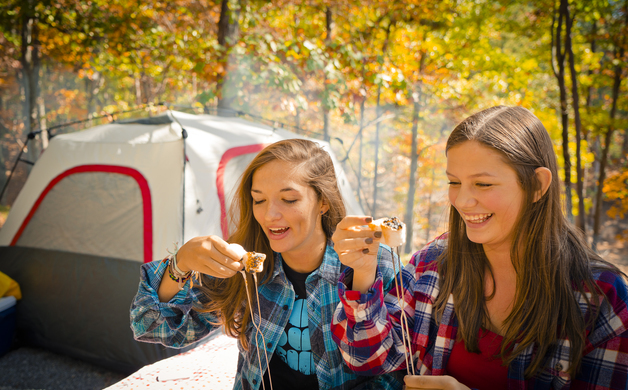 Accommodations include campsites, cabins, lodges, even yurts, and vary by park. Among the Georgia State Historic Sites are presidential homes, ancient Indian mounds, battlefields, plantations and even a gold museum. Georgia’s public libraries have ParkPasses and Historic Site Passes that can be checked out like a book. Content courtesy of Georgia State Parks & Historic sites.